If your business needs an area where vehicles can safely load and unload goods, then consider a canopy structure for your business premises. Canopy structures for logistical services are not only cost-effective but they provide the perfect solution for several requirements of a business. There is no need for foundations or groundwork preparation and structures can be constructed and erected within a few days, giving businesses the perfect solution which is quick and usable straightaway. 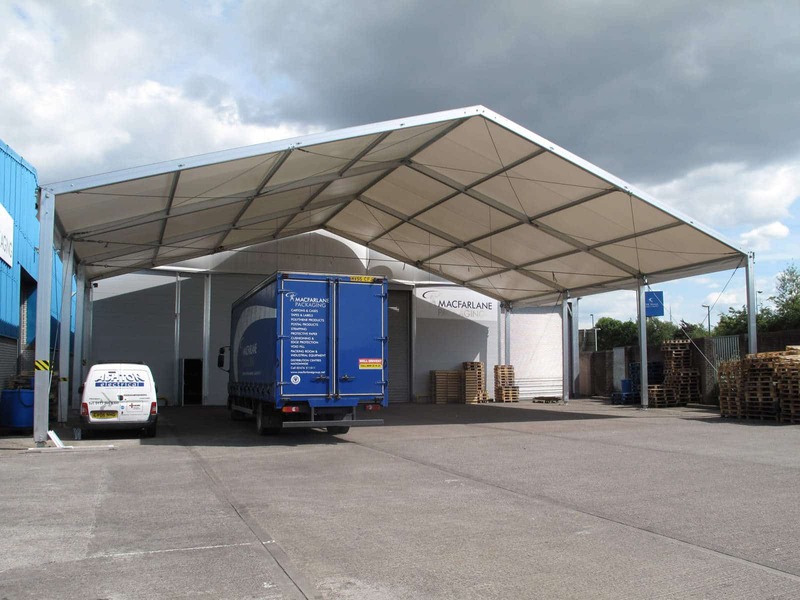 If you need temporary logistic solutions, then canopy structures are mostly assembled offsite, reducing health and safety issues on your premises which would normally happen with typical building work. Structures are gutter linked together and several elements such as lighting can be added if required, depending on your business needs and what the structure is going to be used for. Canopy structures for logistical services can be designed and bespoke-built, whether you need a large canopy for your transport fleet, or a smaller canopy for loading, the flexibility a structure offers is limitless. Why Are Canopy Structures a Good Alternative? Canopy structures for logistical services provide a sensible solution for businesses who need the extra space for loading and unloading or for weatherproof coverage for their transport fleet. Temporary canopy structures are a quick solution because they can be constructed within a few days, making it easier for businesses to get the additional space they need quickly. Canopy structures are also an affordable solution for businesses who do not want to spend capital on a building, avoiding the need to build a permanent structure. Planning a new build on-site can take months and the costs of recruiting a reputable building team, paying for expensive materials, having to get planning permission, all add up to what will be a large final expense for the company. A simple canopy structure is therefore the perfect solution for a business which needs that extra space, but doesn’t want to pay out a fortune for it. Are Canopy Structures Strong and Long-lasting? Canopy structures for logistical services are made from a range of materials including polycarbonate canopies, cast iron, fabric canopies and glazed structures. The frame is made from an industrial aluminium alloy and steel, making it strong and long-lasting for at least 10 years. The roof is a single layer, flame retardant PVC membrane which is of industrial grade. The canopy walls are made from corrugated steel sheets or an industrial grade PVC side wall, and any number of walls can be included in the canopy depending on what you need. Canopy structures can be constructed on the existing surface on your premises and does not need foundations or any groundwork prepared. Structures are designed and assembled off-site, then delivered to your business for the final piece of the construction. Structures can include lighting which is especially useful if your business operates after dark or around the clock. Your canopy can be presented in a colour that fits in with your site or brand, making it look like part of the furniture. What Can Canopy Structures be Used for? Canopy structures for logistical services use advanced modular technology and can be used as a short-term solution, with most businesses using them for between six months to four years. If you require a structure which is customised for your business needs or a structure which is needed for longer, then we can bespoke design canopy structures to suit your requirements. Structures are available in contemporary styles or can be more traditional, large or small. Canopy structures take a few days to install and can be used on a permanent basis or temporary basis. Canopies can be purchased, hired or leased. Whether you need a quick solution, a short-term logistic solution or a more permanent structure, payment options can be flexible and businesses can spread the cost of their solution, instead of having to pay out a lump sum. 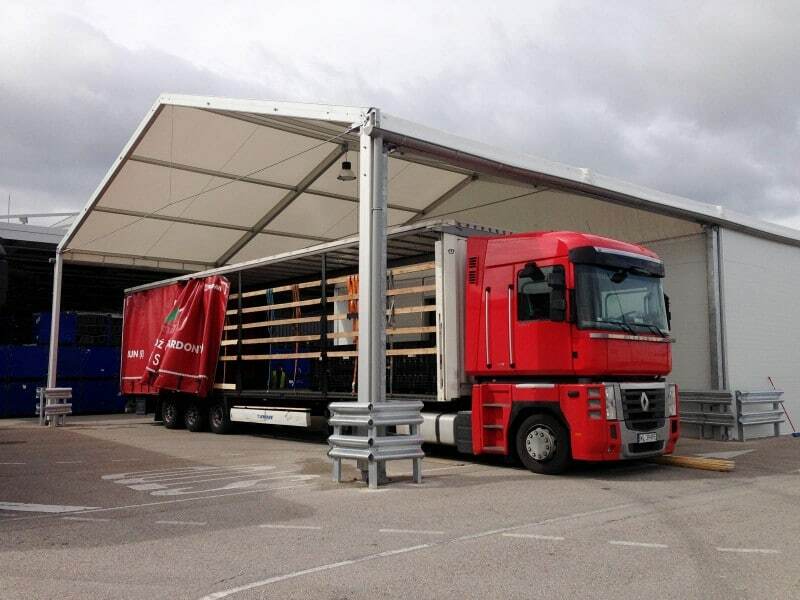 Why Are Canopy Structures for Logistical Services the Perfect Solution? Canopy structures are durable, robust and quick to install which makes them the ideal solution for any business which needs additional covered space. Structures are also easy to extend or modify and are quick to dismantle or remove. They can also be relocated to different premises easily, so if your business moves to a new site at some point in the future, then the structure can be moved too. The canopy roof is translucent and therefore creates a lot of natural light, saving costs on electricity and lighting. Canopy structures are also fully engineered to meet the regional Euro codes and to comply with BS6399 to withstand weather conditions such as wind and snow. 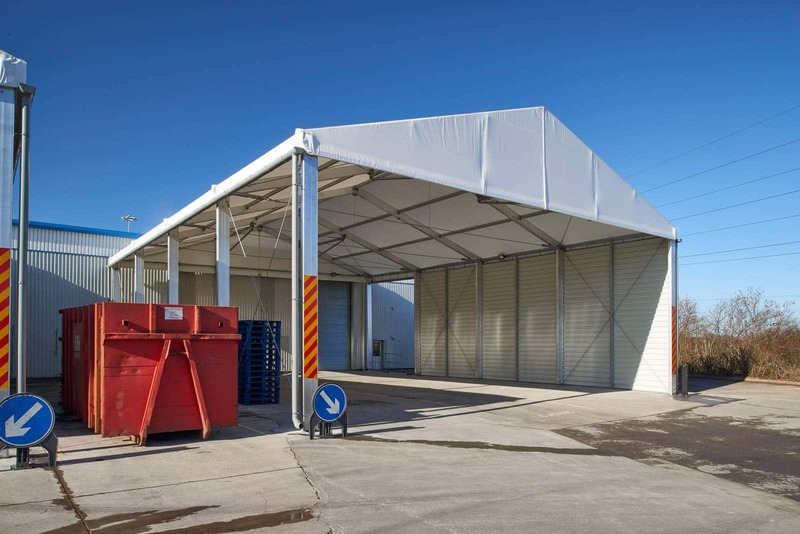 Many businesses link a canopy structure to an existing building or warehouse so that the structure is fully operational straightaway and easily accessible for loading, forklifts, employees and operatives. Canopy structures are available in a range of heights and widths to suit all your operational needs and logistics requirements. Loading canopies are a perfect solution to create a weatherproof loading bay, ensuring your goods are protected from bad weather conditions. If you have specific requirements, then Temp Re Build can design and customise your canopy structure, making sure that it meets all your needs, still saving you costs in paying for a quick, temporary solution rather than spending out for a permanent new building. Canopy structures for logistical services offer businesses a cost-effective solution that is quick to construct and suitable for any premises. There is no need for planning permission or for structures to be constructed on tarmac or hard ground, making canopy structures the best solution for any business. If your business would benefit from a canopy structure on site, then get in touch with us today. Our experienced and professional team can advise you of the perfect structure to suit your business needs.